Mary Irani, from Marina Middle School, is November's Student of the Month. 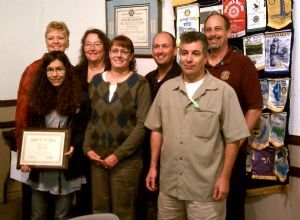 Mary received a certificate of recognition and a $100 savings bond from the El Dorado Rotary Club. Front row: Mary Irani, student, Marina Village Middle School; Linda Irani, mother; Feraidoon Irani, father.